Welcome to Yoshihiko Futamura's Website. This is not the Futamura Projection !!! Yoshihiko Futamura, Ph.D. was born in 1942. He is the Director of InfiniteBio from April 2008 and the President and Chairman of Futamura Institute, Inc. from April 2005. 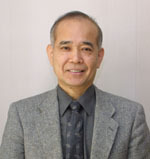 He was a Professor of Department of Information and Computer Science and the director of the Institute for Software Production Technology (ISPT) of Waseda University from 1991 to 2005. He received his BS in mathematics from Hokkaido University in 1965, MS in applied mathematics from Harvard University in 1973 and Ph.D. degree from Hokkaido University in 1985. He joined Hitachi Central Research Laboratory in 1965 and moved to Waseda University in 1991. He was a visiting professor of Uppsala University from 1985 to 1986 and a visiting scholar of Harvard University from 1988 to 1989. Automatic generation of computer programs and programming methodology are his main research fields. He is the inventor of the Futamura Projections in partial evaluation and PAD (Problem Analysis Diagram PDF1MB). PAD has been adopted as an international standard (ISO8631) and a national standard of China (GB13502). He was an editor of the Journal of New Generation Computing (1982-1995). He has been an Advisory Board member of the Journal of New Generation Computing from 1996 and an Advisory Board member of the Journal of Higher Order and Symbolic Computation from 2002. He is a fellow of Japan Society for Software Science and Technology. During 40 years of his career, he has contributed more than 200 research papers and patents on Programming Methodology, Software Engineering and Theoretical Computer Science. Y. Futamura, Z. Konishi, R. Glueck: WSDFU: Program Transformation System Based on Generalized Partial Computation, The Essence of Computation: Complexity, Analysis, Transformation. Essays Dedicated to Neil D. Jones, Lecture Notes in Computing Science 2566, 2002, pp357-377. Y. Futamura, Z. Konishi, R. Glueck: Program Transformation System Based on Generalized Partial Computation, New Generation Computing, Vol.20 No.1, Nov 2001. pp75-99. Yoshihiko Futamura, Kenroku Nogi: PROGRAM TRANSFORMATION BASED ON GENERALIZED PARTIAL COMPUTATION, 5241678, US-Patent, Aug. 31, 1993. Yoshihiko Futamura, Kenroku Nogi: PROGRAM TRANSFORMATION BASED ON GENERALIZED PARTIAL COMPUTATION, 2922207, Japan-Patent, Jul 19, 1999. 24 Aug. 1969: Source Program and Results of Test Runs of Self Applicable PE (PDF10MB This is a very large PDF file.) and Supporting Documentation (PDF2MB). Aug. 1971: Original Japanese Paper (PDF876KB): Partial Evaluation of Computation Process --- An approach to a Compiler-Compiler, Vol.54-C, No.8 of Transactions of the Institute of Electronics and Communication Engineers of Japan, pp.721–728, in August 1971. 4 Nov. 1971: Draft of unpublished paper written with John K. Dixon (PDF2.7MB). 24 Jan. 1973: EL1 PARTIAL EVALUATOR Progress Report submitted to Dr. Ben Wegbreit at Harvard (PDF700KB). 19 Jan. 1978: A Letter from A.P. Ershov (PDF88KB).